Pictured are the first six female golfers to earn All-Ohio Valley Conference honors in golf. Standing, from left, are Molly Fitzwater, Bailey Meadows and Hunter Copley from Gallia Academy, Emilee Carey of South Point, Katy Pertuset of Portsmouth, and Hanna Shrout of Fairland. GALLIPOLIS, Ohio — At least the Blue Angels shared. 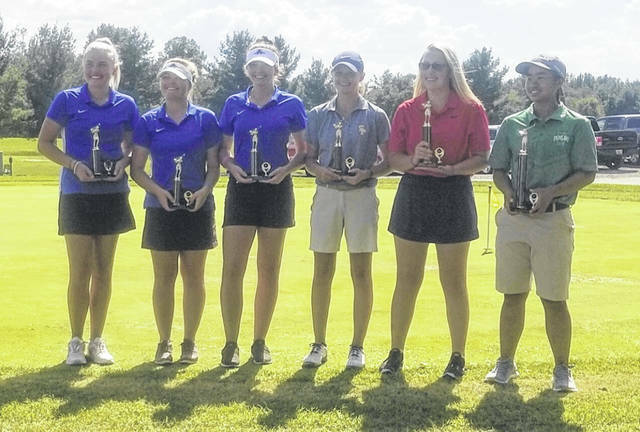 Gallia Academy came away with half of the all-league honors on Friday during the first-ever Ohio Valley Conference girls golf championship held at Cliffside Golf Course in the Old French City. The Blue Angels had enough participants to compete as a team, which was more than most of the rest of the league could say. Due to a lack of a teams, no league champion was crowned — but the girls did play for a half-dozen all-league spots individually. The Blue and White came away with three of those top six positions, with senior Hunter Copley leading the host school with a 91. Copley tied with Emilee Carey of South Point for third place, but ended up fourth overall due to a tiebreaker. Junior Bailey Meadows and senior Molly Fitzwater also came away with All-OVC accolades as the duo placed fifth and sixth overall with rounds of 93 and 94, respectively. Hanna Shrout of Fairland claimed medalist honors with a 3-over par round of 75, while Katy Pertuset of Portsmouth was the overall runner-up with an 85. The Blue Angels had already set school records this fall with a team tally of 370 at the 18-hole Waterford Invitational and a final score of 181 over nine holes on the back nine at the same event.